5 Pieces of Advice for Pregnant Startup Founders by Jessi Chow, Inc.
How to Succeed by Leaving Your Fear of Failure Behind by AJ Agrawal, Inc.
Video: This Startup Shows Why There’s No Such Thing as Too Many Co-Founders Inc.
Kara joined Upfront as a partner in November 2014. Kara is also co-founder of Seedling where she currently serves as Chairman. Prior to starting Seedling, Kara spent close to seven years at IAC where she acted as the Senior Vice President and General Manager of Urbanspoon and Citysearch. Prior to Urbanspoon/Citysearch, Kara co-headed the M&A group at IAC where she lead some of their most successful acquisitions, notably Urbanspoon, Dictionary.com and Aston Hotels. While at IAC, Kara also served as a board member to Hatch Labs, IAC’s mobile technology incubator, where she recruited and advised Tinder. Kara also spent time at Morgan Stanley, Microsoft, and Battery Ventures. Kara: You don't really get to know the psychology of the people in your life, even your closest friends, the way you do your cofounders. I mean, other than my cofounders, the only person I know that well is maybe my husband, maybe my siblings. Female: Be bold. Take action. Female: The narrative needs to change. Female: We can fix this. We can change this, I know we can. Kelly: I'm Kelly Hoey, host of BroadMic. I speak with the most accomplished entrepreneurs, investors, and thought leaders about the issues that matter in building a business. You will get the inspiration as well as the picks and shovels you need to become a better entrepreneur. Today, I'm the BroadMic studio with Kara Nortman. Kara's a partner at Upfront Ventures and also serves as its investment partner. Kara was the founder of Seedling and served as its Chief Executive Officer. Today, Kara and I will be talking about her extensive experience as both a founder and an investor, her advice for founders as someone who has sat at both sides of the table, and what she looks for in the founders she's investing in. Welcome, Kara. Kara: Thank you for having me, Kelly. Thrilled to be here. Kelly: This is like, I mean, anyway, I'm so excited for this conversation with you. So, let's talk about your background a little bit here. You had an early start in VC for seven years on the East Coast with Battery Ventures. Then you returned to VC in L.A. in 2014. You have a startup in between. So how's that road and journey and what made you decide to return to the VC world? Kara: Yeah, I mean, it's been a wonderful journey. You know, like all journeys, high points and low points, and I think one of the interesting things when you look back is it all seems very linear to people, but at the time, you're just making a decision in the moment and then the narrative seems to come together when you get to the end of it. But, you know, I mean, it's been wonderful to be on, kind of, all different sides. I think, I grew up on the investing side, as we talked about, first at Morgan Stanley in a more traditional environment and then at Battery Ventures in an early stage venture environment. And actually with Battery, I was in Boston, the Bay Area and New York, so I got to kind of sit in a lot of different markets. And I always had this itch to go operate, so I spent 10 years between big companies and starting my own company. And, you know, the decision to go back into investing wasn't one that I was actively pursuing. I always like to say that I'm very, very data-driven when I'm in the role I'm in, but I make decisions, I'd say, very emotionally about my career. It's really, you know, kind of that feeling on the inside, the thing that you're thinking about that you can't get out of your head, that you're up till 2 in the morning, working through. And so, the real reason I went back into investing was a combination of a few things. One of the major things was I was back in the city in which I grew up, Los Angeles, and it's a very special time in Los Angeles. And the firm I joined, Upfront Ventures, I thought had a really unique platform and set of people to go basically kind of invest in entrepreneurs in my hometown heavily, but we invest all over the country. But in a way, that was different from the way a lot of firms in Silicon Valley and other places, maybe, approached investing. So that was a big driver for me, and you know, I've always enjoyed coaching and mentorship and learning and the, kind of, intellectual curiosity that, you know, drives us VCs, is one of the really fun parts of VC. And so it just seemed like a good moment in time to come back into it. Kelly: So, I want to say, the time you spent as an entrepreneur, you know, sort of sandwiched in between your years as a VC, has that change affected the way you're investing now? Kara: Oh, 100%, and by the way, I should say, you know, when I was looking at doing any number of things, I always looked for examples and role models. And one of the things I've realized is any sort of background can make you good at the job you're going to do. So don't oversample on my experience, but yeah, I mean, you know, being an entrepreneur, living the highs and the lows of building and running a company and going through all of the things that we hear about and we talk about so much, raising capital, you know, being in...I'd always been in a position prior to that where people wanted to speak to me because I had money. And then as soon as you have no money and no product and no traction, you start feeling really...you know, hearing a lot of nos, it impacts you in different ways than you might expect. I thought I was ready for it, but experiencing that, understanding, you know, kind of the people that I wanted to work with, the people who were there for me, not just during my ups, but more importantly, during my downs. I think one of the biggest things I took away from the experience and also one of the reasons I joined Upfront was my board member is now one of my partners, Mark Suster. And he was most helpful to me, I'd say, when I was in my hardest moments, in my down moments. He made them feel better and sometimes allowed me to be my best version of myself. And that was kind of, you know, that was an interesting model of venture I hadn't been exposed to before, when I think he assessed me and realized no one was going to be harder on me than me. And so when those moments are happening, sometimes your VC can be most helpful by relieving pressure and stress. So, I would say a lot of what I learned were very practical, tactical things around, you know, all the big questions we have around product, market, marketing, hiring, culture, all of those things, I had firsthand experience. But it also was around psychology and how to, I think, help bring out the best in entrepreneurs. And it's different for every single entrepreneur based upon the psychology of that entrepreneur. Kelly: That's amazing, amazing. So, before we dive back into some more VC stuff and your world there, just tell me, what motivated you to cofound Seedling? Kara: Yeah, you know, it started off as a different company. It went through a couple iterations and it's one I'm really proud of. You know, if I go back to why I started it, I mean, I guess what I'd say is, it's what I referred to before, which is it was completely irrational for me to leave IAC, where I was at the time, big public company run by Barry Diller. I had a great job. I was well paid. I actually resigned from IAC when I was five months pregnant with my third child. So I had a nice maternity leave set up. I'd always loved by maternity leaves. But what I found was happening...and by the way, I didn't, sort of, you know, I didn't sort of grow up feeling like I had to start a company. So I'm not the story of, you know...I mean, I started little businesses when I was growing up, and apparently that's a sign that you have it in your blood. But I didn't feel like it was something I needed to do before I died. I always say, you know...I love when people say, "I have to be an entrepreneur." And I say, "Well, why? What do you want to do?" "It doesn't matter. I just have to be an entrepreneur." And for me, it was very much about a specific thing that energized me and motivated me and captured my heart and my mind in a way that I had never felt before. And so I met one of my cofounders and I was really, you know, she was talking about doing something that really spoke to a pain point I had as a mom and something I'd thought about sort of in the broader macro market sense, which is, you know, we set up our kids in this way to prepare them for a world that does not exist. And we send them to schools that were made for the industrial, you know, economy. And we do a lot of memorization, and we really focus on content. And what we don't do as much of is empowering them to really grow and learn and focus on the process as opposed to the outcome and find their own, you know, kind of, almost like their own internal entrepreneurial spirit. And so, I was at a stage in my life where that, you know, we started working on this concept. And I really started by just advising her, and it was one of those things where it was all I was thinking about. I was pregnant, working till, you know, doing my day job and then some, you know, starting on this other concept and doing work on that at 10 o'clock at night, having my husband, you know, get frustrated with me because I was coming to bed at 2 in the morning. And it was just one of those...I just felt like I couldn't do anything else other than to go do this thing right now. Kelly: I'm sort of laughing because the next question I want to ask you is like...and having just heard that, you know, you quit a well-paying job when you were five months pregnant and this was your third child and all this other kind of stuff, and so I'm laughing as I'm going to ask you this question. So what did you love most about your startup experience? Kara: In a way, I would say what I loved most is that I think I found the bounds of my emotions and capabilities. You know, that would be one thing. You know, I had always been in, I guess, a safe environment, and, you know, really understanding what it's like to run your own business and the highs and the lows that come with that are incredible. I'd say, you know, second, understanding...like, kind of, you know, I did it in my mid-30s, right? And at that point in time, we've all kind of labeled ourselves. "I'm good at X. I'm bad at Y. I need to complement myself with these people. I'm so self-aware. I know myself so well." And I found I just ended up having to do things that I didn't have a passion for and I didn't necessarily know I was capable of. You know, there was a period of time where I was just on the phone constantly with vendors all over the world, trying to get, you know, sourcing prices down significantly below where they are. I knew I could do that, but I didn't know I was going to love it. You know, I mean, when it's your business, sort of like, just getting down to the brass tacks of doing so many of these things is really kind of inspiring. And honestly, it's influenced me a lot as a mom and like, all the growth mindset stuff we talk about. But just believing in yourself and believing you truly can learn almost anything to some level was inspiring. You know, I think one of the other things that it did for me is it finally got me to a place in my life where I got comfortable with failure. And, you know, there are moments in time where you just don't know if it's going to work, and figuring out, like staring that in the face, where really, you know, the idea of losing money from people who had faith in me, who were important to me personally and professionally, was a big burden. It felt like a big burden that I didn't fully anticipate, and I think it's something that shouldn't feel like a burden. I'd say that's one of my lessons as well. People who give you money when you're starting a business are fully ready to lose that money, so just always remember that. But, I think, getting comfortable with the fact that you could fail was very liberating and has been really, really liberating to me ever since. And, you know, one of the things one of my partners said to me at one point is he said, "You know, we've had X number of multi-billion dollar companies, and I think the number is something like 15, and almost all of them went through a near-death experience." And so, kind of, you know, and that's where it comes back to resilience is such a critical factor in getting through these things. So, I mean, that's maybe a little bit of a multi-pronged answer, but I would say, you know, getting comfortable with failure, understanding the highs and lows and kind of getting a new wind in my sails to believe that I could do things that I maybe hadn't allowed myself to believe I could do were some of the best things. And then I'd say the final best things were getting to know my cofounders. You don't really get to know the psychology of the people in your life, even your closest friends, the way you do your cofounders. I mean, other than my cofounders, the only person I know that well is maybe my husband, maybe my siblings. And it's just so interesting because we think we know and understand people. And when you get into the layers upon layers upon layers, you just realize everyone is so different and really taking the time to invest in understanding what makes everybody tick, how to bring the best out of each other, how to set up roles and responsibilities, I think, is a fabulous experience and gives you, hopefully, a lot of insight into, you know, for me now as an investor, how to think about those things for the companies I get involved with. Kelly: Wow. That's like, awesome, like, amazing. I could just have you keep going on that answer for the rest of this session. So, let's talk about your current role. How'd that come about? Kara: You know, like I said, I've known Mark...Mark was one of the first people I met when I got back to L.A., you know, eight and a half years ago. And we, you know, we really spent time getting to know each other in a very, you know, long, deliberate, but with no specific goal in mind kind of way. I was at IAC when we met. We had lunch. I, you know, I got to know his wife, who I also think is fantastic. I got to know his companies while I was at IAC. You know, and it was just...I think we had a good chemistry and a good mutual respect for each other. And then, over time, I started to get to know the other Upfront partners. I got to know those group of guys over a period of time, honestly without ever really thinking I was planning to go back into VC anytime soon. It was sort of something I thought I might do or something I thought I would do at some point, but I had operating in my blood. I knew I had another thing or two in me. And so, you know, it'd come up on occasion with Mark and the others. And I got to a point where I just felt like, you know, I'd set my company up to a good place. I felt like L.A. was at a really interesting moment in time. I felt like I'd gotten to know these guys and they were guys that I'd really enjoy working with. And, you know, one thing led to another. Kelly: And the timeline, in terms of getting to know people, because, you know, as Jessica Peltz, who's been on BroadMic before, as she said, if you're entrepreneurs, you know, some of these relationships with these entrepreneurs, these startups you invest in last longer than marriages. You know, jumping into a fund, you're like, "Okay, I'm going to be here and working and looking at these guys for what? The next 7, 10, 15 years, whatever it may be. I better know how they think and be able to work with them. Otherwise, you know, what's the point?" Kara: Yeah, and what I would say, whether it's raising money, finding your next job, whatever it is, it's finding those people in your life that you think you have chemistry with and who you leave conversations kind of with your mind racing and feeling like you're pushed to be a little bit better, stronger, etc. And just making sure you invest in those relationships. Kelly: That's good, awesome advice. So for Upfront or other top VCs, you know, there's always the question of how you get your deal flow. If I'm some startup founder listening in right now, and I wanted to get, you know, my pitch deck in front of you, walk me through. How do you guys source deals? What does that world look like? Kara: Yeah, I mean, look, I think, you know, that the most helpful way to get to, you know, an institutional venture capitalist or really anyone who invests is a warm introduction from someone that both sides know and respect. So that's the most helpful way, but then still, there's a broad universe of types of companies that could get to us. So, you know, one of the things I think is helpful today, which wasn't the case, you know, kind of 17 years ago when I started at Battery, is that you can, as a VC, you can kind of put out there in the world the things you're interested in. And those things are always shifting, but, you know, I can tell people, for example, "I'm very interested in funding the best teams in Los Angeles, and I want to meet them as early as possible. I may not invest right when I meet them, but we build our relationship, I get to know you, etc.," that's number one. I love investing in and supporting female entrepreneurs, that's number two. But then, specifically, we all have our interests, and you can't fake your interests. And my interests are changing and evolving. They were different a year ago than they are today, but you know, I tend to be most interested in the places where industry meets technology. So, you know, some of my interests are around things like manufacturing, additive manufacturing, design tools, simulation software, like stuff that actually is sort of like, kind of, I got to know while building Seedling, the stuff that, you know, makes sourcing products difficult. So, you know, that's an area. Another area I'm really interested in is workplace education and how do you create, you know, kind of the next generation of workforce around everything from, you know, diversity, but diversity to support an end goal that, you know, kind of shows that you're going to do better from a profit and economic standpoint. But also just career pathing for all kind of steps of the workforce, I guess you could call that non-traditional education. Another area where I'm starting to spend time is around health tech, and I'm still developing my theses there, but I've had a particular interest around women's health, around, you know, telemedicine, around, kind of, personalized programs that help people make small behavioral modifications. So those are a lot of the things that I'm interested in. Will I still occasionally, you know, find that I'm passionate about an e-commerce company or a pure marketplace business? Yes, but what I try to do more so now is just spend people's time wisely when I do get an email introduction and ask a few questions to see if it makes sense to go down the next stage, because what I found is if you can't get passionate about what the company is doing, you know, even if you like it from a business standpoint or you like what the team stands for, that's not a good recipe for me. Kelly: Okay, so say is really getting excited about it so you're always there to take their calls or work a Rolodex or whatever it may be, help them, you know, work through a problem. You talked about your own investment thesis. What's the overall investment thesis of the firm? Kara: I mean we're all about funding exceptional entrepreneurs. I'd say we're pretty opportunistic in that regard. And then we all kind of have a thesis or two at a time where we're particularly interested or we have a particular depth. So as a firm, we invest in primarily Series A companies. Occasionally we do some C. Occasionally we do some B rounds. And we do two, on average we make two investments per partner per year. So I'd call us a high-conviction firm, meaning we're going to come in, we're going to have a real vested interest in making sure the company does well, is financed, gets the right people, kind of, around the table to build it to the next phase. And for that we need to own, you know, it's just to make our own business models work. And then we really invest across the tech spectrum. So, I mean, we're invested in everything from consumer products companies, where the tech element is, you know, kind of rationalizing the supply chain in unique ways and going direct to consumer, all the way to, you know, a company that's inventing wireless energy and has a large patent portfolio. So, I'd say broadly we spend a lot of time in places like digital media, retail innovation, enterprise SAS, marketplaces, and I think we're getting more and more into looking at some new themes that are interesting to us, food and ag tech, manufacturing, health. Obviously, kind of, the role of certain technologies across all of those areas are pretty interesting to us, so given we sit in L.A., we look at a lot of, you know, VR and AR applied to everything from entertainment use cases to kind of more utility or industry use cases, like health and education. So, I mean, a pretty broad realm, but I'd say generally speaking we're looking for entrepreneurs who inspire us, who we think can hire well, can move through problems, can pivot when they need to pivot, will be credible when they can go out and fundraise and bring in additional capital. And then we have to believe there's enough of a market to give the entrepreneur, you know, for them to go out and get some data points. They don't always need to be financial data points, but where there are, you know, kind of data points that can show that this has a venture like scale potential. Kelly: Yeah, yeah. So you said Series A. What is Series A these days? Kara: Yeah, good question. I mean, what I always say is we're C or A, depending on what city you're sitting in. So, and by the way, we're doing a lot more B these days, just given the market is soft and we're, you know, I think we think these are the moments in time when potentially the most interesting opportunities come up. But I'd say, you know, our initial check, our median initial check is $3 million. We write checks that are a lot less than that. And probably our largest first check is $10 million. But our probably comfortable sweet spot is, you know, two and a half to five. And, you know, I think of all the investments I've made since coming back in, my smallest check was $2.5 million and my largest check was $4 million. So I'm kind of right in the middle of that sweet spot. And then we, of course, reserve capital to continue supporting the company through its journey. So over the life of an investment we may get quite a bit more than that. Kelly: You know, let me ask this question too, thinking about whom you're, in terms of funding and who you're funding. Do you ever fund solo founders? Kara: Yeah, I don't we have like, you know...I think that rules are meant to be broken and I think none of our portfolios are ever big enough to really put out trends that you should follow religiously. You know, I always think data's interesting when it comes out. I love data. I love all of these kinds of analyses that come out of portfolio, but then you'll see an asterisk and it's like, "Here are the things in our portfolio that work if you pull out Uber." Well, you can't really pull out Uber because that's kind of what venture capital is about, finding those one or two Ubers in a 10-year period. So I think generally speaking, it is helpful to have a co-founder, mostly because it's a hard and difficult journey, and if you can find someone to share the load of that journey, I think it sets you up psychologically to be more resilient. But we see single founders do well as well. And for some people, if you have that resilience internally and, you know, kind of depending upon the psychology of, you know, how do you push through your hard times? How do you make decisions and how do you collect information? If you do all those things well as an individual, then you don't necessarily, you know, need to have a cofounder. And candidly, you end up with, you know, kind of more equity to give away to early people you bring in and you can make feel like cofounders. Kelly: No one can make a decision, no one can be the leader? Everyone? Kara: I think that ends up creating more challenges more often than not. Again, you see companies where it works well, but once you get beyond three cofounders, you know, I think it gets trickier, just from what I've seen. It doesn't mean we wouldn't fund a team that had four or five cofounders. I just think it's trickier and you want to make sure everyone's head's in the right place and you have real leadership and, you know, people may end up in different roles than they started in and that's going to be okay. Because the founder stuff is the stuff that, you know, can end up really allowing a company to thrive or hurt a company and setting it back. Kelly: Yeah, absolutely. And I'm glad you brought up that, sort of that too many founders point. I haven't heard anyone talk about that, so that was very helpful. Thank you. All right, I've got our final questions for you. So this, Kara, is our pay it forward. These are quick and dirty answers, so we're going to make this really fast. You don't need to give any explanation for your answers, no rhyme or reason. That's all we're after. So, here we go. Our pay it forward questions that I ask every single listener. What are you primary sources of information? Kara: I would say a combination of Twitter, Nuzzle, if that's how you pronounce it, Techmeme and I read quite a bit on Medium. I also listen to a number of podcasts, everything from Recode, Andreesen Horowitz. A recent one I'm listening to is called PulseCast [SP], I believe. So a lot of different sources that I move from one to one. And then, of course, I love the New York Times and Wall Street Journal. Kelly: There we go. Good shout-out for the old media. What book are you reading? Kara: I am employing a venture capital model to reading and reading a few simultaneously to pick a winner. So I'm reading "In the Age of Cryptocurrency." Just invested in a company that's looking at doing some interesting things with block chain and I want to get smarter. I'm reading "Grit," which is an interesting new book that just came out. And yeah, I need a new fiction book, so if anyone has any recommendations, I'm in need. Kelly: Okay, well, there we go. We'll see what answers we can get for you. Do you have any rituals or habits you swear by? Kara: The biggest is running, you know, I think running just clears my mind and gets me focused in a way that nothing else I've ever found does. Kelly: There we go. The heck with yoga and meditation, back to running. Who are three entrepreneurs or leaders you admire? Kara: So, I kind of, I think, depending on where I am in my career, I pick and choose differently here. But right now, I'm spending time kind of thinking about reading about people like Kevin Plank from Under Armour, Denise Morris from Campbell Soup. Both of them are in, you know, companies that you would think of in a particular way, a particular type of product, and, I mean, they're doing some really unusual things to innovate from within. Kara: Don't wait to do what you think you want to do. You know, I hear a lot from people, "Well, I'm going to go do this so I can then go do that." And sometimes that's useful, particularly if you're straight out of college, getting a real skill set, I think, is useful. But, you know, if you think you want to go start a company, if you think you want to go into venture, if you think you want to, you know, go into marketing and you're an engineer, just literally figure out how to start doing it today. You may not have a job in it, but figure out how to make it a hobby. Figure out how to help someone. Figure out how to take a job nobody wants at your job and fill a white space and not expect to receive any thanks from it. Kelly: Are there any particular myths that you would like to dispel for our listeners? Kara: Yeah, I mean, one that drives me crazy is when people say, "Oh, I'm not a math/science/engineering person, so I can't do X." And this goes back to the beginning. I think the myth that you have to be formally educated or trained in something, even a highly technical field, is wrong. You have to, if you're going to run a company and build a company and take funding around a company, you certainly have to know what you don't know and surround yourself with smart people and figure out how to assess who has that talent and who doesn't. Kelly: Any words of advice you would give to listeners about taking risks and closing the confidence gap? Kara: Yeah, I mean, I would say that, figure out what you're willing to wager and then assume you're going to lose it and go do it. And what you're going to wager may be the beauty of your resume. It may be salary. It may be, you know, mortgaging your house. It may be, you know, just going into a new role and not doing it well. But I think if we kind of allow ourselves to be comfortable that we're going to go try some things and they're not going to work and we're going to fail, then we're going to be much more comfortable doing them. And in terms of the confidence gap, I would just say every single person, particularly women, has this sort of like this imposter syndrome until you don't. And you kind of get over it, I think, a little bit too late. And just fake it until you make it because, you know, everybody is. It's just some people are self-aware enough to know they're doing it. Kelly: Love it. Can you give me the name of one female entrepreneur who's below the radar that we should know about? Kelly: Yeah, I just funded a fantastic female entrepreneur here in Los Angeles. Her name is Milana Rabkin, and she started a company called Stem.is. It's a platform to make it easier for independent artists and digital content creators to manage their rights, create simple contracts across all their collaborators, and get paid real time. Kelly: Awesome. And what does "Think broad" mean to you? Kara: Okay, I think it means two things to me. I think one is always challenge yourself to think like a beginner in places where you know a lot because the places you know the most about, you are often the most set in your ways and maybe the least likely to actually see and believe in innovation. So one is think like a beginner. I'd say the second is challenge yourself to learn about things that are outside your comfort zone. For me, I usually need to have a goal associated with it. So I will throw a dinner or write a blog post on an area I don't know as much about and it forces me over a short period of time to go learn it. Kelly: Awesome. Thank you so very much. I have so loved talking to you. Kelly: Thank you for listening to BroadMic. We welcome your feedback. Find us on Facebook, where you will have show notes and additional references for a deeper dive into today's topic. Subscribe on iTunes so you never miss an episode. Please review our podcast on iTunes, which will help other listeners discover BroadMic and grow the BroadMic community. BroadMic is produced by Christy Mirabal with editing by John Marshall Media. 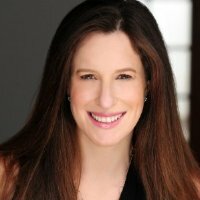 Our executive producer is Sara Weinheimer. Think Broad.